One cup of alfalfa sprouts contains 10 calories and 0 fat. These sprouts also contain vitamin E and A as well as minerals like calcium. The vitamin A in alfalfa sprouts helps prevent lung cancer. 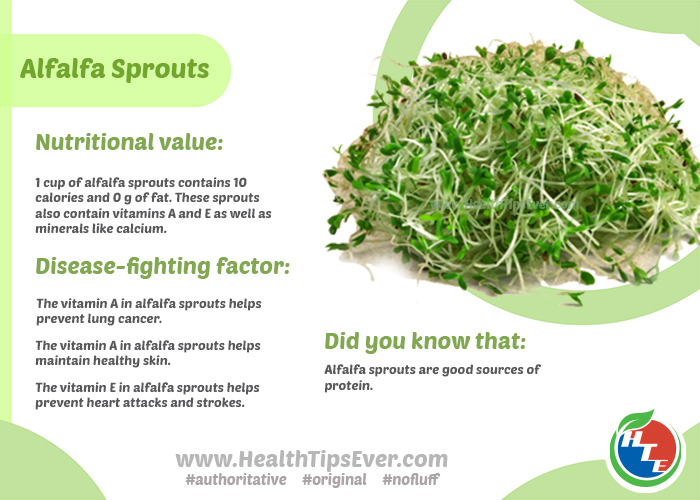 The vitamin A in alfalfa sprouts helps maintain healthy skin. The vitamin E in alfalfa sprouts helps prevent heart attacks and strokes. Alfalfa sprouts are good sources of protein.